Jan 4 - Great New Year for Freedom. It is getting a new outdrive rebuild - actually the first - for Christmas and for 2012. This is a preventative maintenance rebuild on my 1996 drive with 5,000 hours. The only thing wrong, that I know about, is the pin that holds the yoke is solid in the yoke while it rotates freely at the top and bottom bushings. 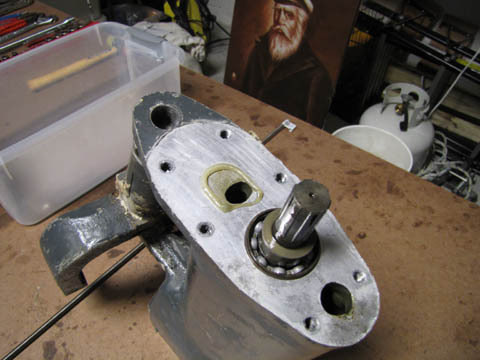 I want to inspect the upper and lower bearings, check out gear lash, and then put it all back together with a new zinc. In addition, Gale on Blue Heron has about 2,300 hours on his 2008 Gemini after completing the loop and wants to take a look inside his too just in case. He also needs a prop zinc. Then we both need some paint. 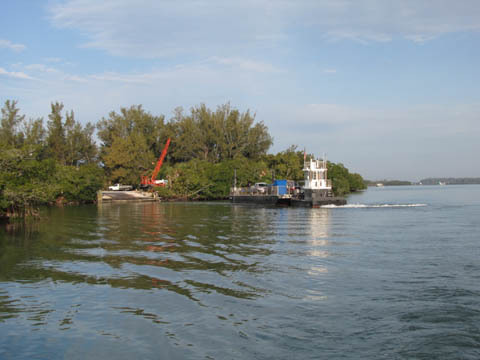 The first step was for me to go out to Ft. Myers Beach and we took off Gale's drive. We did this in the water and didn't drop even a drop of oil into the water. The next day, Gale came out to my house and we took my drive off in the water. I don't have the big seat in the back so we stretched a 2x6 across the handrails to hold the drive up when we take the pins out of the drive. 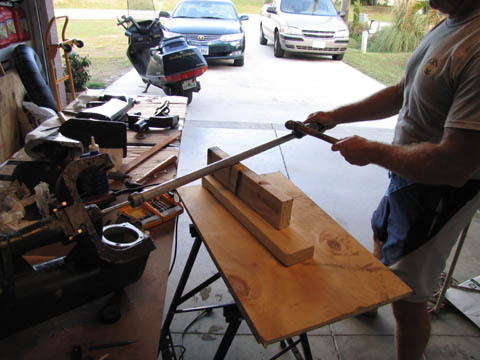 Next, we put a small tube such that the drive goes through the center of the tube. Then place several trash bags across the opening of the tube and line the top with oil absorbent pads. Obviously, we drained as much oil out of the drive as possible before this started then "belched" the bellows to get as much oil out as possible. I had already found one of my set screws wouldn't come out easily so I previously drilled and got it out with and ez out. Keep in mind, we are having fun here! 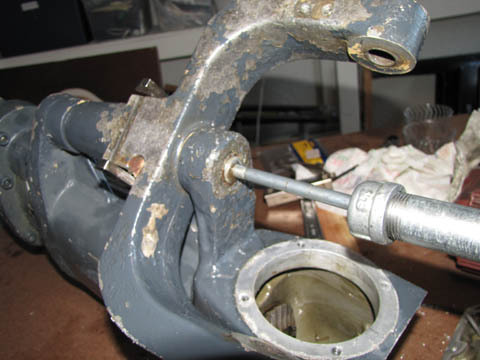 When we pumped up the drive to put the tube on it, the hydraulic line broke at the fitting. 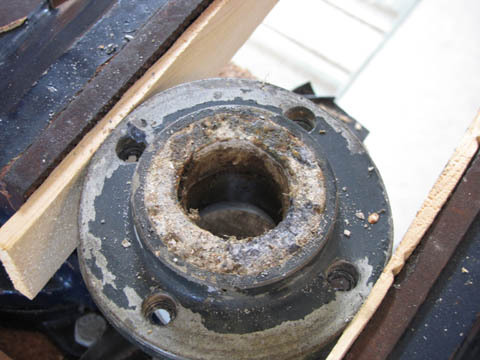 I have an old fitting which rusts and I have had to replace it before. Caught most of the hydraulic fluid but sorry environment. This was going to happen the next time I pumped up the drive wherever I was. Good thing it was here. We grunted and got the drive to shore and in the garage. To the right you can see Gale's drive. It is in really good shape and it is obvious his is newer than mine by 12 years. As we go through the pictures below you can see to the lower right the zinc does need replacement and we already planned on replacing the prop seals too before we saw them. I had borrowed an electric impact wrench which made it really easy to break free any of the allen headed cap screws that were too tight. Then we used my battery drill to back out the screws. Gale's drive was coming apart nicely and giving us some real confidence. 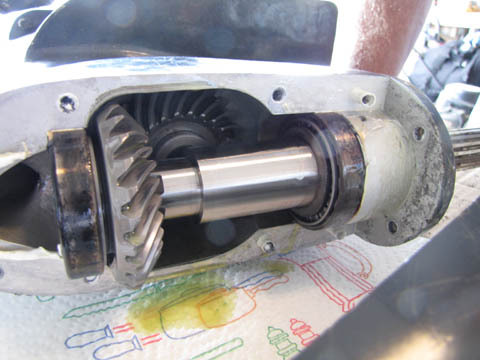 Above right you can see the gears, bearings, shaft, and prop hub. Looked really good to us. He has the upgraded bearings. To the left you can see the brown stuff on the casting. 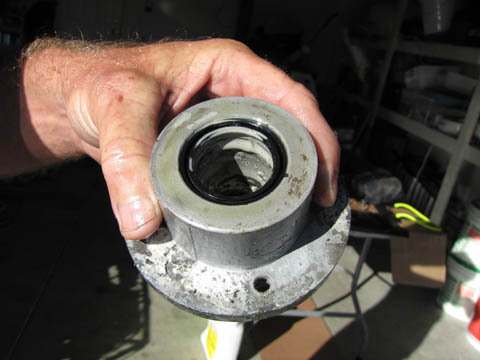 This is a locktight bearing fit which is to keep the bearing race from moving in the casting. 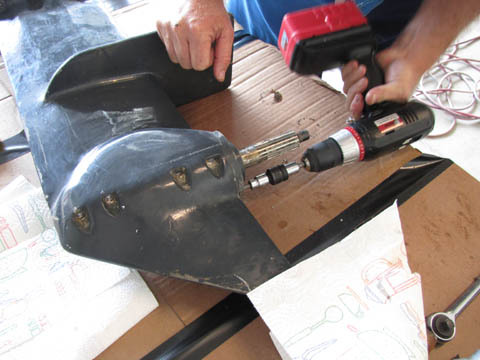 I had previously talked to Tom on Sun Cat who said the mechanic rebuilt his drive leg and when they put it back together it had a squeal. 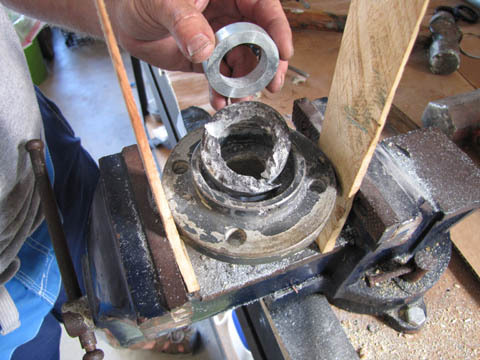 It had to be torn down again and the problem was he didn't use the bearing fit so the race was turning in the casting. 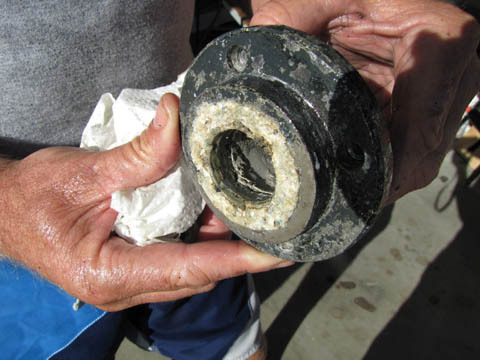 I expected to see the remains of the bearing fit and as you can see, we did. 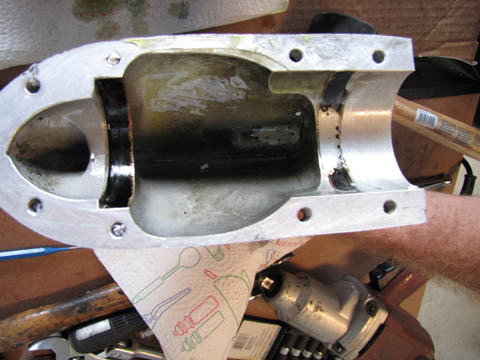 Then lower left you can see where we removed the prop seals. There are two back to back. The picture below shows the aluminum spacers which are very thin. They are used to set gear lash. One of those assemble, test, add more or take away one then reassemble until you have the right setting. 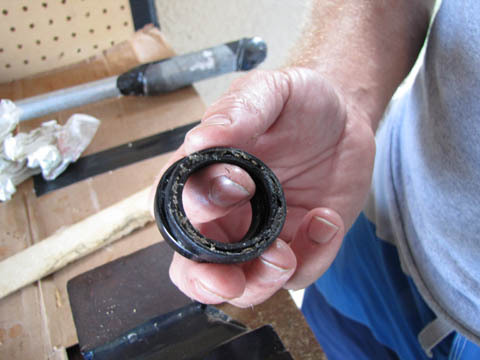 After we get them all right, we will then put on all the bearing fit and gasket sealer to make it permanent. 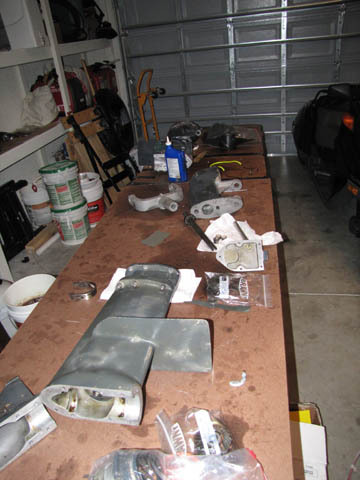 To the right you can see both of the prop shaft gaskets. In both Gale and my case the seals were good. We both have a minor ring warn into the drive shaft that we will 400 grit sand and then steel wool buff so it won't hurt the new seals. 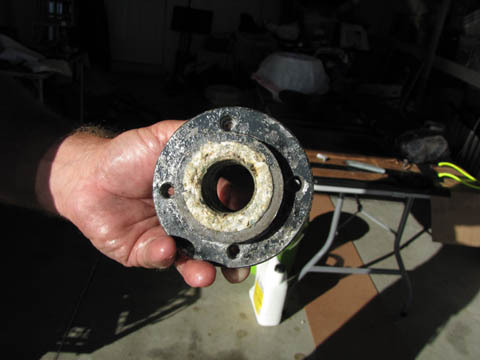 Below you can see the zinc in the prop hub. They both look this way and need to be replaced. 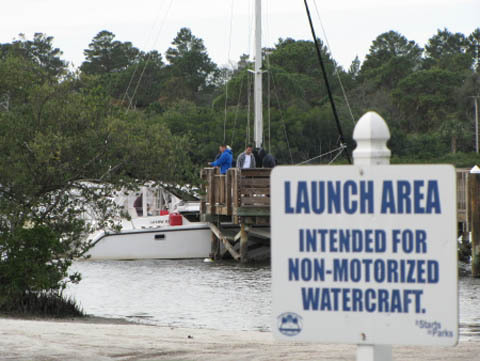 Probably replacement at 1,200 - 1,500 hours or if you leave the drive in the water much, sooner - would be prudent. 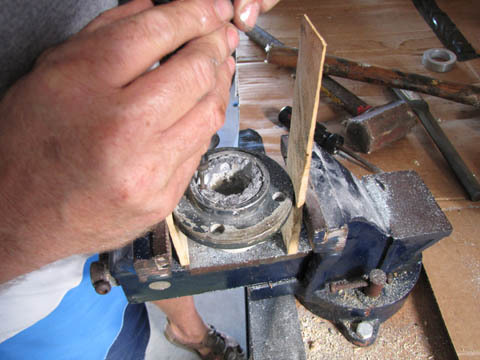 We placed the hubs in a vice and used a dremel tool to cut away the zinc so we could get them out. They are hammered into place so it is an interference fit. This is the result of the dremel tool work and you can see a new zinc being held up. Yes, we are still having fun. Then it came to my original drive - now why would I say original? You'll find out shortly. The seals looked good in my drive too. Now was the time we were going to get the pin out. What you are seeing is the Walt pin puller that I copied off of his video. Great idea if you've had your pin out in the last 5 years...... mine hasn't been out in 16 years. Houston, we have a problem. We beat, and beat, heated, and heated, beat, and beat, then soaked overnight, then beat, and beat, then pressed and beat, then I gave up trying not to ruin the casting. I took the upper portion of the casting off to soak it in the above outdrive beating scenario and finally gave up. My outdrive is the old spacer design so you can get to the bottom of the pin with a press. I figured that I won't ruin this casting and instead take it to a "professional machine shop" where the "pro's" can get that pin out. The machine shop at my old College could work wonders so these guys could probably do the same. They have a 100 ton press and get these things out all the time! Well sort of. Bottom line, I actually paid to have someone crack the casting on my drive and ruin the yoke. After thought says, I could have ruined my own casting but boy would I have felt really really bad. Now I just feel a bit poorer. So what now. Spend 4,500 for a new drive, spend 1,200 for a new casting and yoke, or ?????? Depression was the operative word. It always is for about 2 hours then my mind takes off and starts creating solutions. 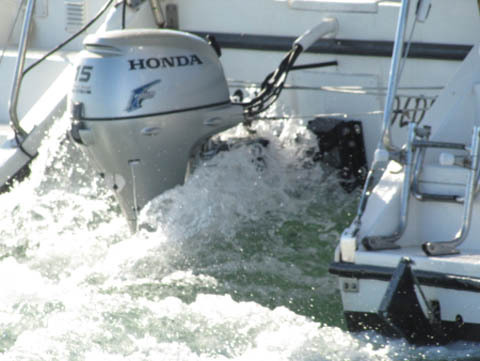 I remembered my friend Bill up in Clearwater had a second engine failure so he replaced the entire setup with a Honda long shaft 15 hp outboard. I gave Bill a call and he said he would discuss selling it to me with his partner. They had been keeping it in case a future owner might want it or if they weren't happy with the outboard. So far they had been happy so I would have an answer the next day. 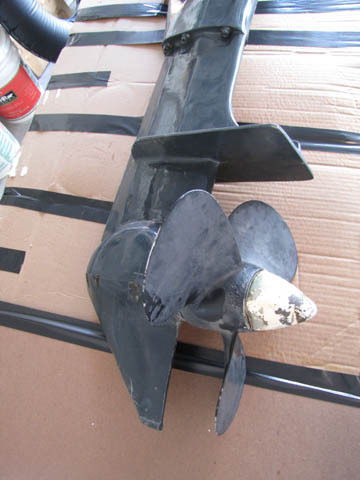 I also found one on E-bay that was practically new but had a broken yoke plus the transom plate wasn't listed. I now had options. Bill told me their drive had a few issues, the pin wasn't rotating well and there was a whir in it when the drive was down and they were sailing. It would need to be torn down to inspect. Ok, 3 drives in 1 week to tear down would be fine if they decide to sell it. To keep this story shorter, Bill and his partner did decide to sell. It was my opinion that I would rather give money to a friend for a product than someone I didn't know so I was off the next day to pick it up. Bill spent some time and got the pin out so that big issue was finished. 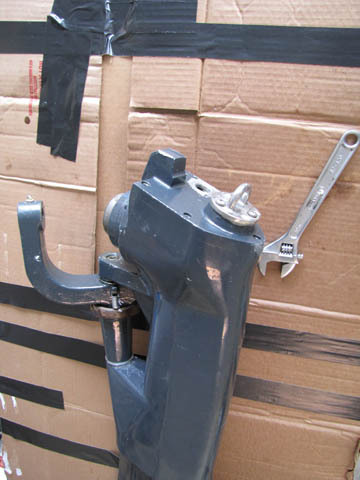 The other cool thing was I was able to get a spare yoke, the transom plate, hydraulic pump, and hydraulic ram. All great parts for more extended cruising. I digress, our plans from this point on cruising are primarily for trips to the Bahamas or 1-3 week trips. Unless we are making a short river cruise for fun with friends, we won't be boating. Also, we are preparing for a Caribbean cruise in about 5 years. The boat must be ready and tested for our next big adventure. Back to the outdrive I bought from Bill. Bill was the second or third owner and one of the previous owners had left the drive in the water quite a bit. 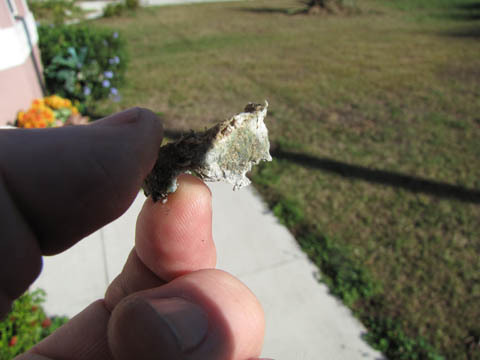 It had lees than 2,000 hours on it but showed as much corrosion as my old drive with 5,000 hours. So, it will need a pretty good sanding along with zinc change. You can see the zinc to the left. 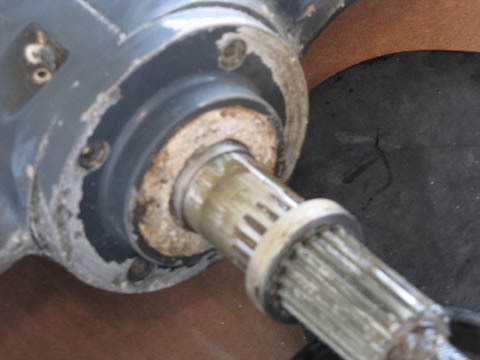 We took the bottom skeg off and this drive had more corrosion in the threads but the borrowed electric impact wrench did it's magic and we got all the allen head cap screws out. Then hit it a bunch with a rubber mallet and off it came. 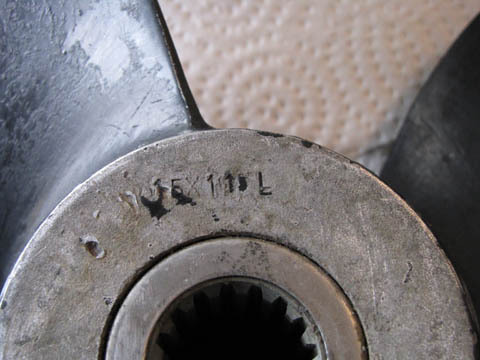 The prop seals looked fairly good considering the corrosion from the zinc had penetrated the first seal. It was clear no water had entered the drive which was more good news. As you can see to the right we found some "stuff" in there too. What you are looking at is melted fishing line. This was partially binding the shaft to the zinc. It could be what was causing the whir Bill had heard. 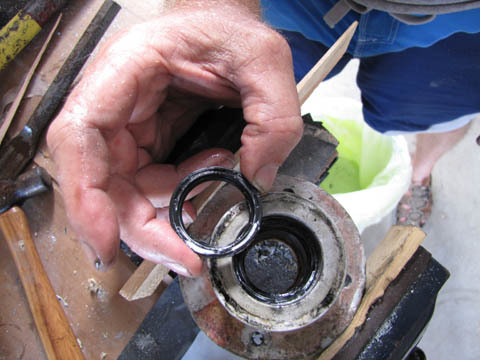 Still, we were rotating bearings and cleaning them all up. 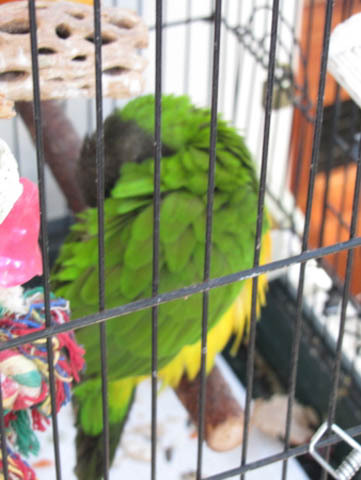 By the time we finished, they rotated very well, no broken cages, and no other issues that we could find. 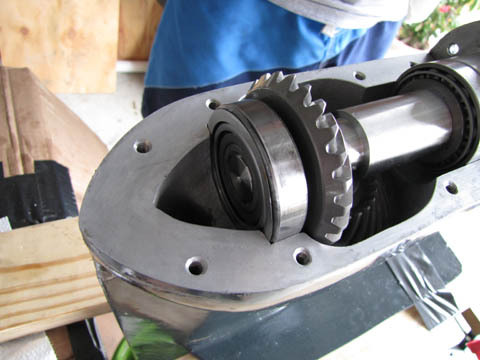 We put some synthetic oil on all the bearings and gears then put together the parts needed list. Since this all occurred right before New Years, I wasn't surprised that Sillette Sonic was closed for the holidays. They reopened yesterday, Tuesday the 3rd. I really want to relate my conversation with James who was VERY knowledgeable about the outdrive about some of what I considered the important points. 1 - They quit using duckams grease about 10 years ago because it skins up. He agreed that you should use a very high quality grease. They use a high end marine grease but also liked the idea of Mobil One Synthetic or other Synthetic. 2 - I told him that based on my experience, I would be pulling the pin EVERY time I changed the bellows which is about every 3 years as a preventative maintenance item. He said if people did pull the pin, clean it up and re-grease it, he thought I was right that they would never have a problem. 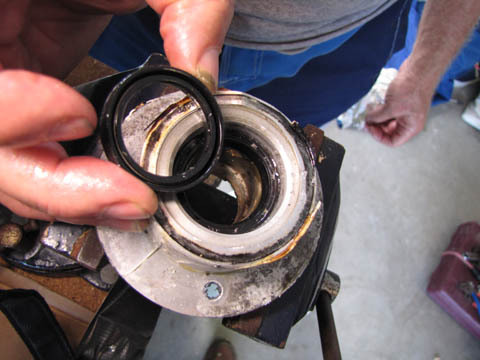 3 - You must secure the bearings to the non-movable surface with a bearing lock. All of the bearings are secured this way and NONE of the bearings are pressed on. They have found that some may need to be heated with a propane torch to loosen them - especially true of the top units where it goes to the CV Joint. 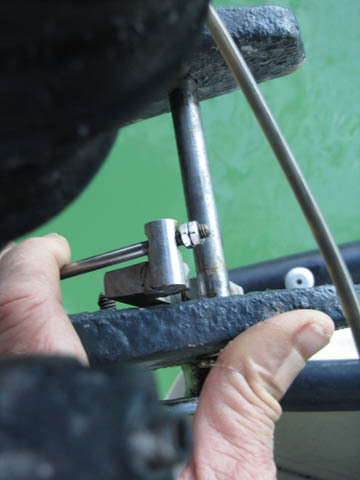 4 - I simply related my experience with the locking mechanism and how many I have adjusted by simply loosening the two nuts and locking them so there was some space between the nuts and the release lever. In every case it has fixed the reverse lockdown problem. He also agreed with that but added that if something had been hit then there could be other damage causing a problem. I related that I simply hadn't encountered that problem yet with damage. Overall I found Sillette Sonic very open and honest in their discussions. So that brings us to being back out on a boat again. Bob, remember Bob, is the person who lives right around the corner from us and we brought his Gemini down from Norfolk. 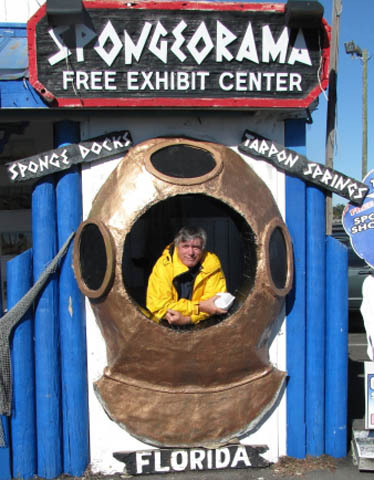 Bob wanted us to take him up the west coast of Florida to pick my brain on everything from maneuvering the Gemini in tight quarters, systems, and of course seeing all the great places on the west coast. So, we planned a trip and will be gone for about 10 days. This picture to the left is one you've seen before but always brings a smile to our face as we head down river. 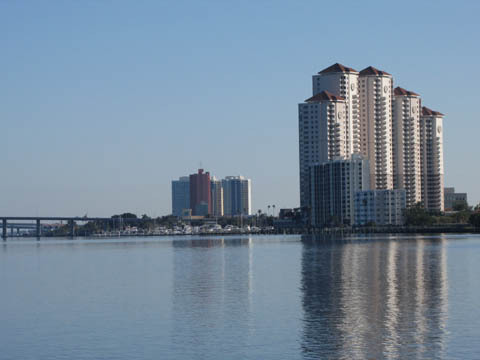 This is Fort Myers and signify's we will be gone for awhile on a boat. I didn't take ton's of pictures so far on this trip because you've seen them all in my past logs. 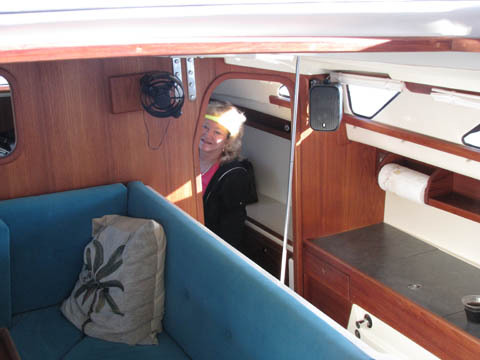 Everything was checked on the boat before we left and checked out ready to go. We did have a few issues we will take care of while out on this trip. 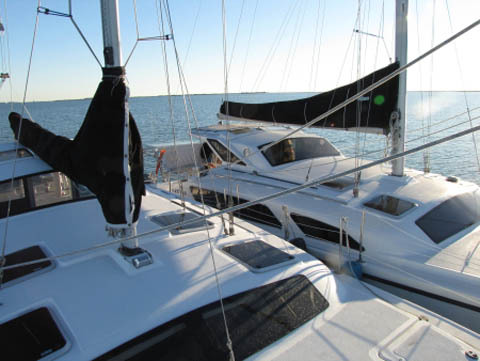 First night we spent at Cayo Costa anchored. The next morning we headed out to the Gulf to avoid the bridges and simply enjoy the Gulf. Unfortunately, the winds were nonexistent so it was a motoring day. 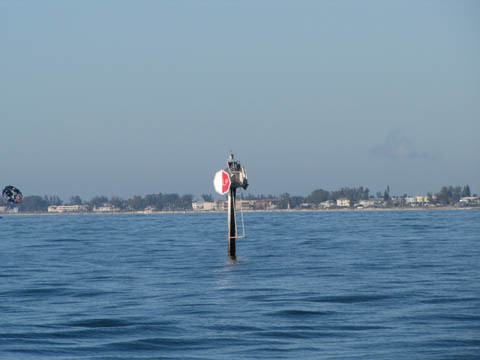 We pulled in by the Longboat Key safewater mark which you see to the lower left and headed for the Longboat bridge. They opened and on New Years Eve we found people covering up the anchorage. We had planned on having a light dinner at Moore's Stone Crab Restaurant so we lucked out and found a space at the end of their dock. If you eat, you can stay the night free. We took advantage of the free dock. Great meal and good nights sleep so the next morning we were off inside to pick up some fuel. 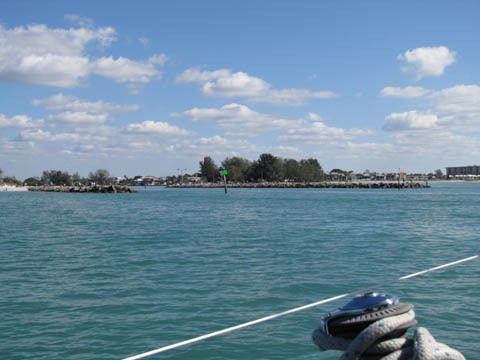 We made our way to the Bradenton Beach Marina and got some good experience turning the boat around in close quarters and we picked up enough fuel to get to Clearwater. Bradenton Beach Marina wanted 25 bucks for a pump out so they were only getting enough of our fuel purchase to get to Clearwater. Sorry but us sailors got our reputation based on value not of free flow of money out of our wallets. 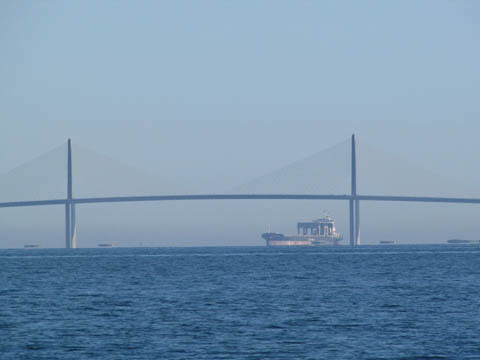 We made the two bridges and headed into Tampa Bay where we had some company coming. Bob said this was a great example of what is wrong with our country. 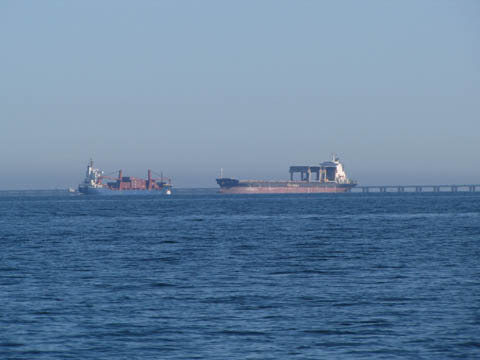 Look at the container ship that is loaded. It is coming into Tampa Bay. The one with nothing on it is exiting Tampa Bay. Bob called this a great example of the trade imbalance. Once again, we headed out into the Gulf and we picked our way out along the shore so we could cut our trip down in length. It is actually very easy here because there was about 8 feet of water that allows you to head north or get in to the bay from the south. We passed this lighthouse on our way out of the Bay and currently it is our plan to anchor there tomorrow night on our way back home. Arriving in Clearwater at about 2:30 we pulled into the fuel dock, filled up with fuel, water, and pumped out. 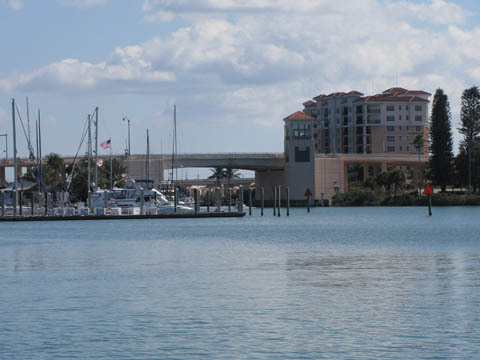 I've talked about Clearwater and the city marinas before but it proved true again. 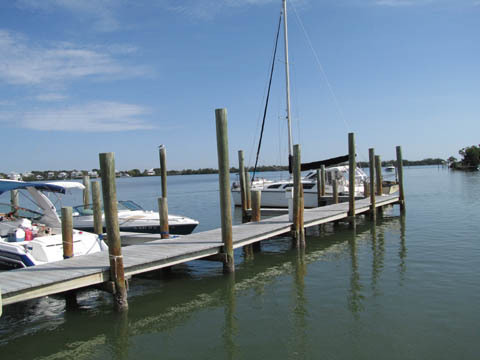 I asked the dockmaster if there might be a place we could pull into for a couple of hours to go up to Crabby Bills. He said, "sure." He found us a spot at the end of a large T-head and asked that we go as far on an end as possible since he may have another large boat coming in there. The message is they are great up here. We had a great appetizer along with a drink and headed back to the boat. 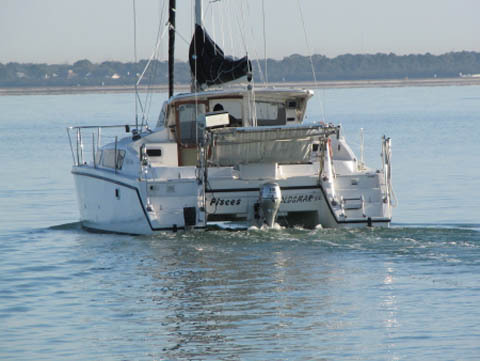 We were going to anchor by the causeway and needed to set two anchors. 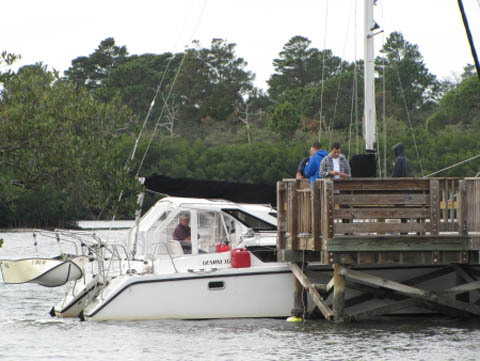 This was Bob's first time to set up a Bahamian moor so he ran the boat and I dropped the first anchor then dropped back 180 feet and dropped the second. We brought the boat back to the middle and secured the anchors. We had a wind coming early in the morning as we could sleep well knowing we had two anchors down and we wouldn't be going anywhere. Let's just say we were happy we had them down since we had winds of ...... 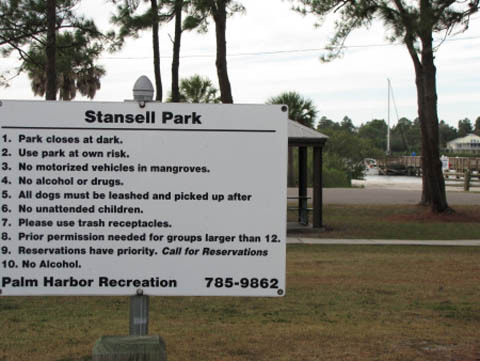 I'll finish that story in a couple of days when I bring you up to speed on the trip to Pop Stansells then to Tarpon Springs. 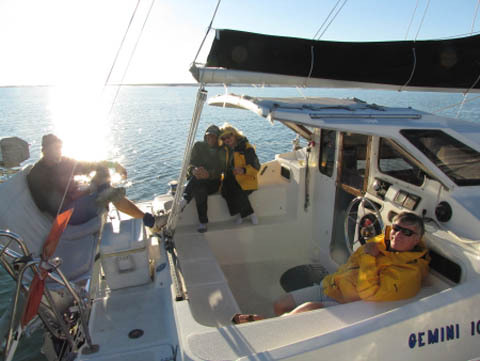 Jan 6 - The winds picked up to above 25 knots at about 5 a.m. from the north. We were in the perfect spot since a causeway was up wind to us. The two anchors held fine even though I was looking out the window every 15 min just to make sure. Hate to loose the "bosses boat" to a little front! At 10:30 we started up the motor and picked up the danforth so we were just hanging on the Rocna. We were getting ready to pick up Bill so we had local knowledge to get into Pop Stansells. 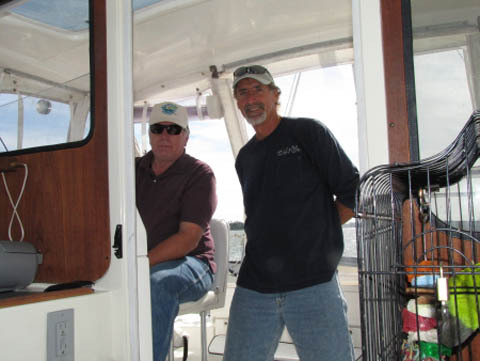 You might remember Bill from our website in about 2009 when he came out and rafted up with after our last trip down the Tenn Tom - not to say it is the absolute last but it's the last one we took. Regardless, Bill is a great guy and one of my go to people when I'm questioning a problem. He's also the guy I bought the "latest" outdrive from. Of course he own's a Gemini. 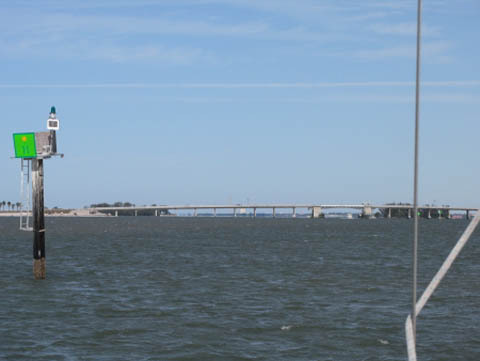 Below is the picture as we are heading towards the bascule bridge towards Tarpon Springs. Above you see that sign that says Shoal? Well, after a couple of calls to even more locals we got this far. Bill was thinking they said go to the right of the sign here. Oops, should have been left. We weren't hard aground but we were sort of aground. We had already put a pin in the outdrive release but obviously we needed to have it further out. Let me stop for a minute - getting into this park was the main point of this trip besides seeing all the anchorages and inlets we could. I won't go into why but it was important to Bob and with Bill and I along, we made it. To the left you can see the sign and Bob's boat at the dock. Then again in the two pictures below. As you can see in the picture to the lower right, Bob had a pretty good smile on his face. We achieved one of the missions for the trip and now WE have local knowledge too. Although if I took our boat in there I think Deb would kill me. Afterwards we took off and went to a friend of Bill's where we were able to dock for the night and meet some really, really cool people. Frank and Jo Ann. They owned the house and Frank is a WWII Vet and is 91 years old. He had a blast giving me a bad time and I have to tell you we laughed for 2 days. Why so long, there was a C O L D front that came through and it got down to 27. Winds were still blowing like stink and believe me we were doing good just hanging out with all of our new friends. Thanks Bill. 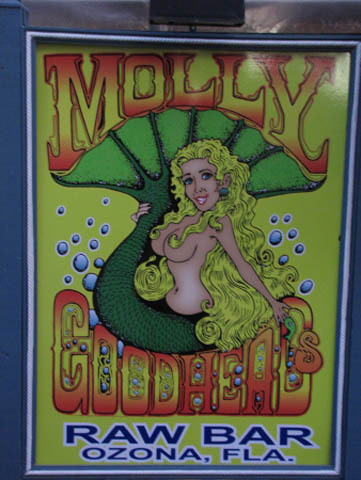 We went to Molly Goodhead's for dinner which seems like a good cruiser restaurant. 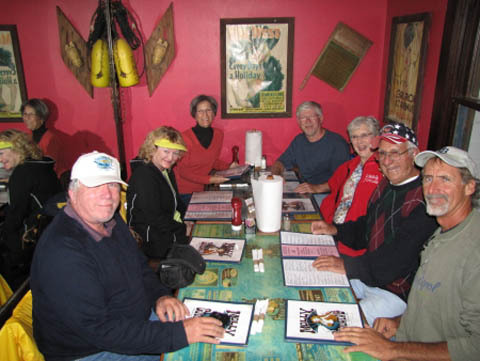 To the lower right you can see (L to R) Bob, Deb Barbara, Jim, Jo Ann, Frank, and Bill. 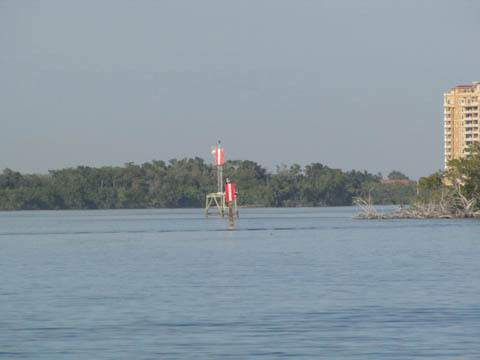 The next morning the guys went for a ride over to Tarpon Springs to show Bob much of the area in case we didn't get to come up the river. 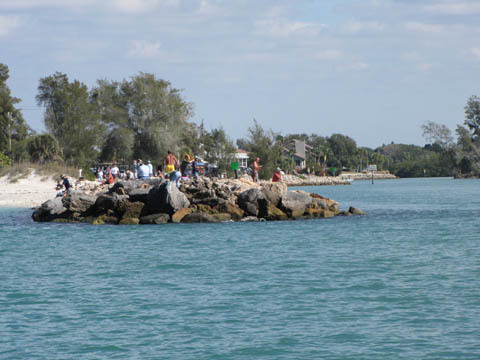 On the way through town, we encountered the set-up for the Tarpon Springs tradition where the Priest throws the cross in the water and all the 16 year old boys dive for it. The boy that comes up with the cross is supposed to have good luck for the year. Why would they do this in January? Too cold for me to go swimming but then again, I'm not 16. 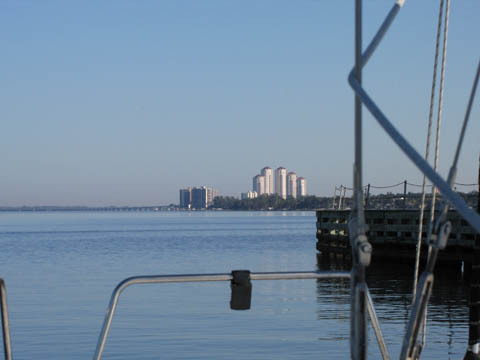 We left Frank's dock on Wednesday morning and the winds had dropped to almost nothing. 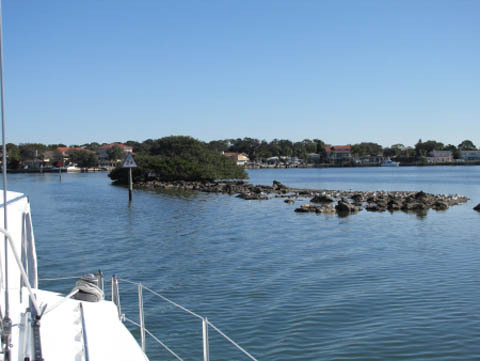 So we headed to Tarpon Springs so Bob could see the area by water. On top of that, I haven't taken enough pictures for you so the camera was out and shooting. 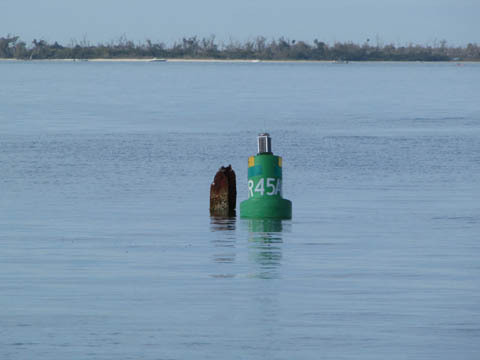 Below you can see the channel Bill uses to get to his dock. It's a bit narrow and you really hope you don't get on those rocks. 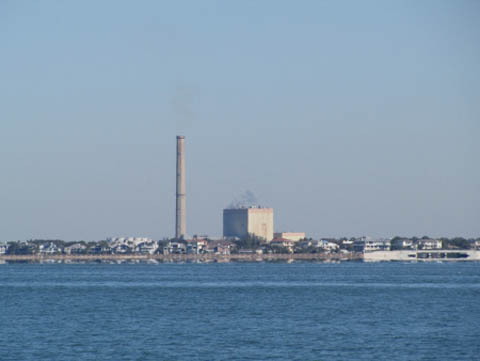 The smoke stack is the major clue you are near Tarpon Springs. 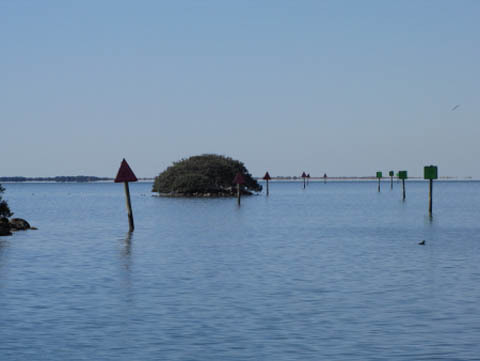 It can be seen for miles and miles and is what you look for when you are crossing from Apalachicola to Tarpon Springs. 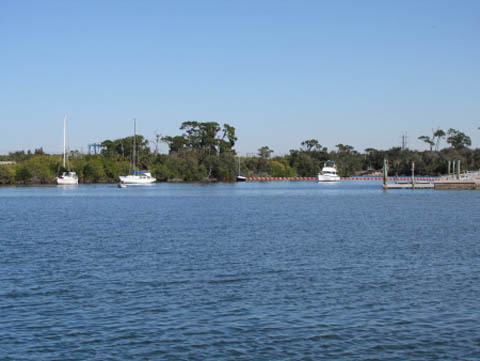 We headed up the river and on the left is the anchorage we've used in the past by the boat ramp. It looked like some full time liveaboards have moved in. 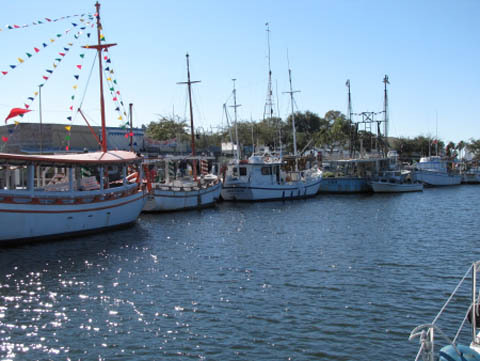 Then we continued up the river and Tarpon Springs along with the sponge docks were about a mile and a half away. 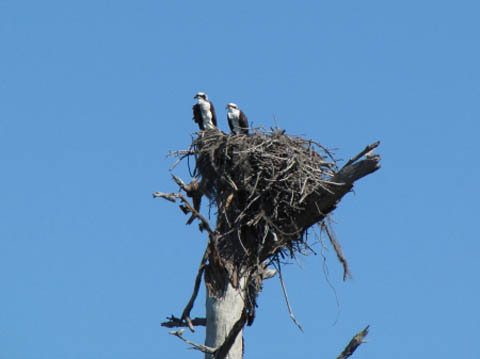 Deb noticed a nesting set of Osprey on top of a dead tree on the way up. Look like a happy couple to me - where's the next meal? In the river. 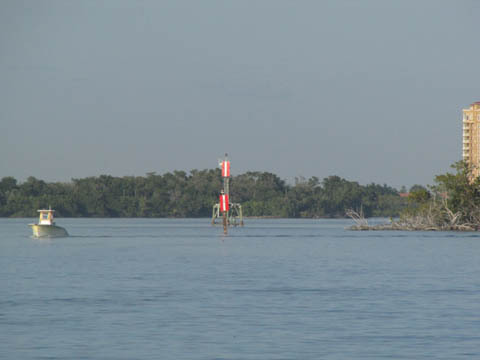 We could see Tarpon on our bow. The lower pictures show more of the boats which make their money off of tourists showing them the river and what traditional sponging was all about. 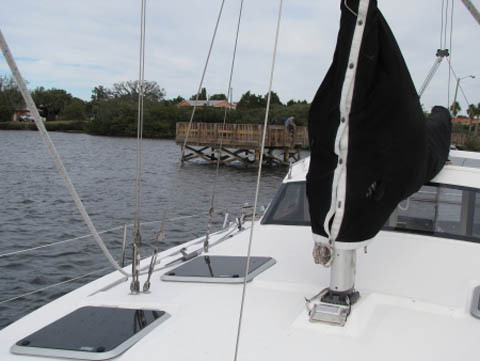 As we reached the end of the navigable portion of the river for a sailboat, we saw a dock that had free dockage for up to two hours if you eat at the restaurant. It was noon, we were hungry, so we called and docked. 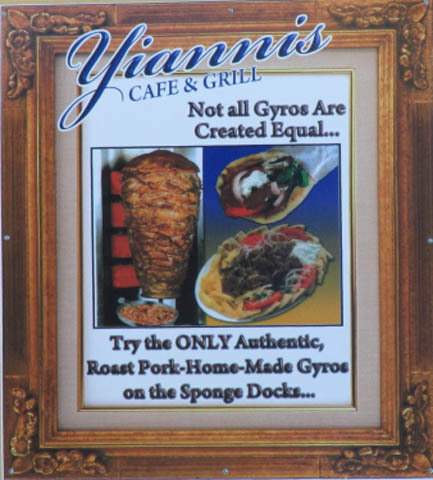 We had a great Gyro along with some Greek salads. It was delicious and now I know how to make the sauce they use on the Gyro's. On the way out, I twisted Bob's arm so I could get this picture on the lower right while he was diving for sponges. It's supposed to be his next year's Christmas Card. 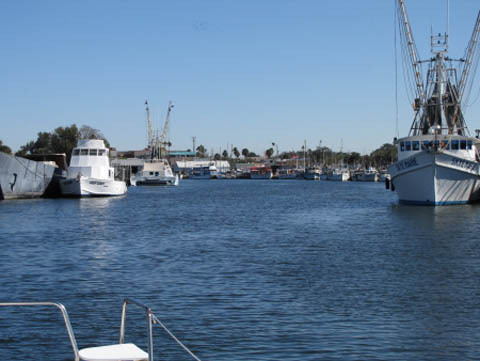 We pulled off the docks and headed back down the river to meet up with Bill and Sissy on their Gemini. 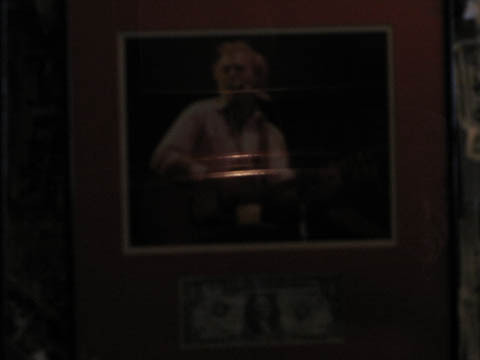 as you can see, Jimmy Buffett decided to take a nap and we just had to get his picture. We had a great time rafted up off of Three Rooker. 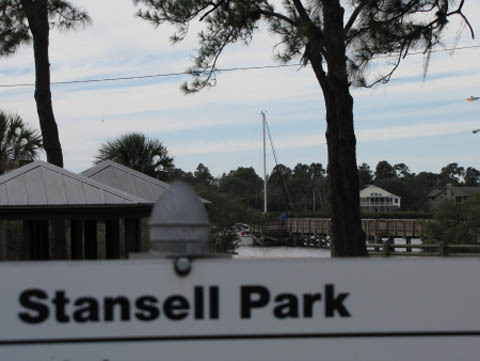 This is one of Bill's favorite anchorages since it is only about 2 miles from his dock. Doesn't it look like fun? We were finalizing our plans to go to the Bahamas in May/June and we now have a pretty concrete plan. We even have some people working on airline reservations who will be joining Bill and Sissy while they are there and on the way back. Let me know if you want to go with us. The trip is as follows. 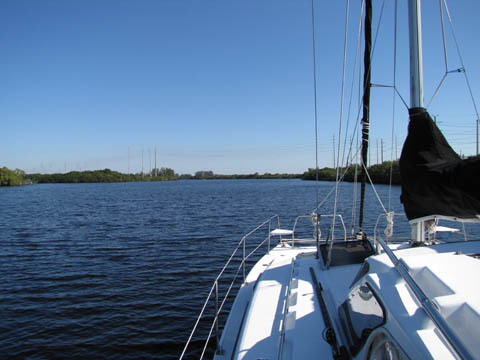 We plan on meeting at Lake Worth on May 10th departing as soon as the 11th but it may be later based on the weather. 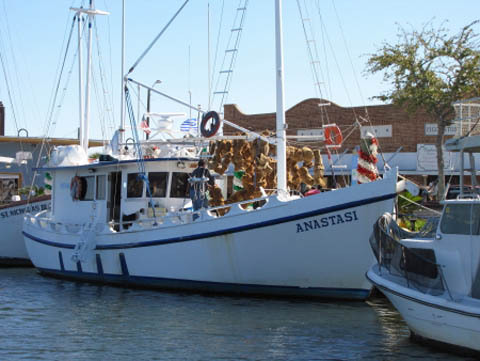 We will be returning starting from Marsh Harbor around the end of the first week of June to the start of the second week of June. That means we should be back in Florida by the mid to end of the second week of June. 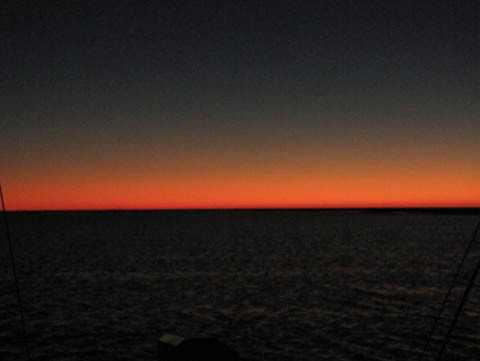 We had a beautiful sunset and more importantly, we had a wonderful dinner with wonderful people. I love cruising and can't wait for our Bahamas' trip. 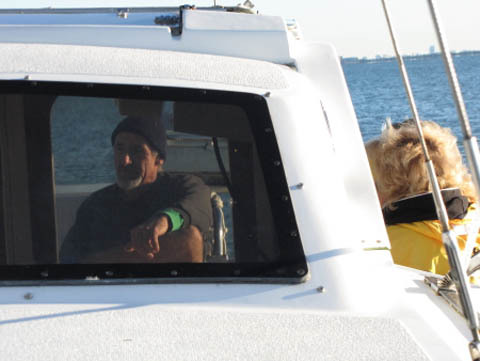 Thursday morning, we dropped off of Bill's boat and he led us out of a pass I hadn't used. What all Gemini people are interested in, or should be, is Bill's Honda 15 installation. I haven't documented it all but I will tell you it is a very good installation and the 15 does a very good job! You can see below we were saying goodbye and we will see each other again! Back to that Honda 15. 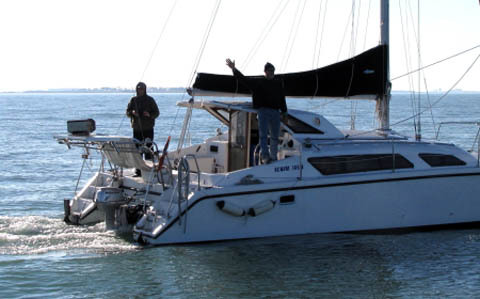 He runs it at about 3,800 - 4,000 R. P.M.'s and it does about 5.5 knots in smooth water. This is VERY close to the Westerbeke's cruise. It has a very quick electric tilt which Bill loves showing off. 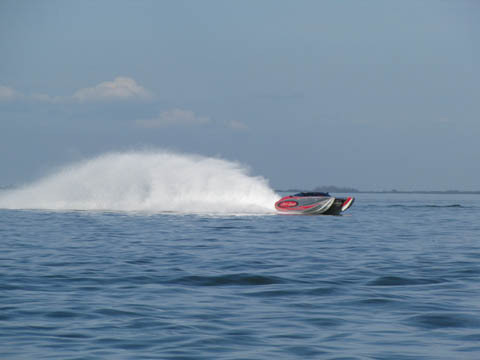 It is really cool and honestly, if I would have known the results before I had my engine failure - I would have gone this way. I have to say I would rather have a 20-25 hp but this one would be a great solution to the major expense of repowering with a Westerbeke. Gemini owners, enjoy the pictures of a very good installation. I took this sequence of pictures so Bill could see the water splash pattern from the rear view. He may or may not want to add a splash plate on the mount. And they say at the end of Captain Ron - then they were gone. 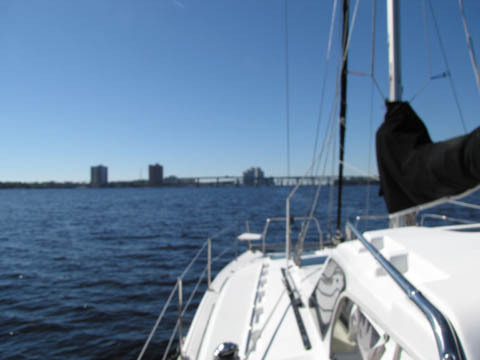 We headed on south and anchored at Egland Key in Tampa Bay. 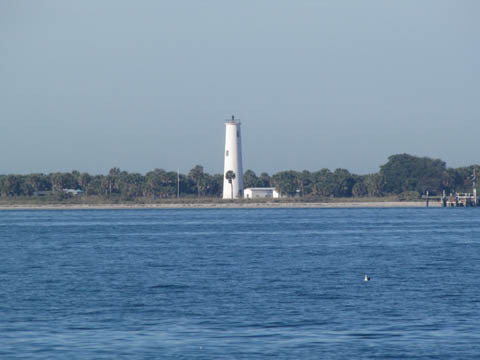 Then we headed out this morning and have anchored about an hour or so north of Port Charlotte. 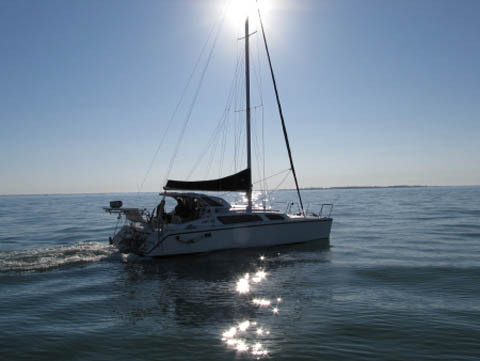 We plan on having lunch at Cabbage Key tomorrow then continuing south to turn and anchor at Bimini Basin. I've never been in there and it will be another good spot to show Bob. We'll finish our trip up by fueling up, pumping out, then getting to Bob's house around noon on Sunday. It's been a good trip and I've pretty much been demoted to anchor windlass, wash down pump, mechanic, and cook. Bob's picked up just about all my tricks and learned lots of great maneuvering techniques. So my goal and Bob's goals have been accomplished. 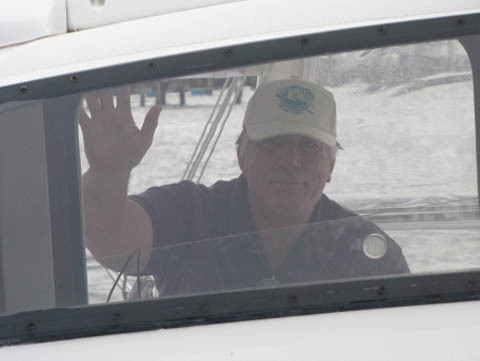 As they say in Captain Ron - Bob, your the Captain now. We'll update more in a couple of days and of course you can look forward to Gale and I putting our outdrive's back together. I hope we didn't forget how. 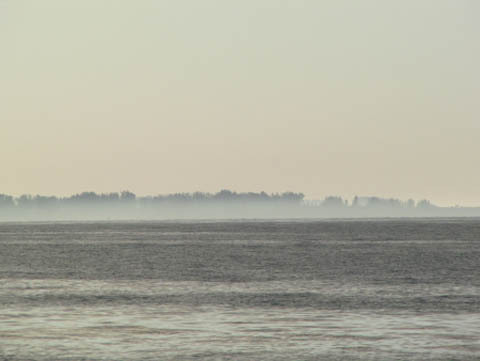 Jan 15 - As you can see to the right, we had a bit of fog as we were heading down the western coast of Florida. 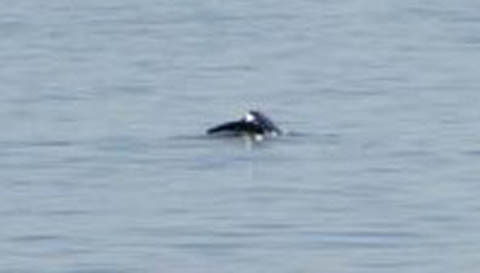 We were about 2 miles offshore so the 500mm lens helped me out to get this picture just off the shore. Lots of fun. We decided that we would take another "new" inlet at least for Bob. The Vinice inlet is very good and well marked. This gave us a good opportunity to see some new water along with "doing some more bridges." As it turns out, Bob had spent a summer as a bridge tender so bridges were a pretty much "no-brainer" for him. I had looked that morning at a couple of website's to get some warnings about a few areas that might have been questionable water. However, my guess is the posts were wrong because all we saw was good water depths. When we came inland we now had to meet the schedules of the bridges. You can see two in this picture. You have to wait 10 minutes between the bridges but then again - we are on the water and who cares about a few minutes. 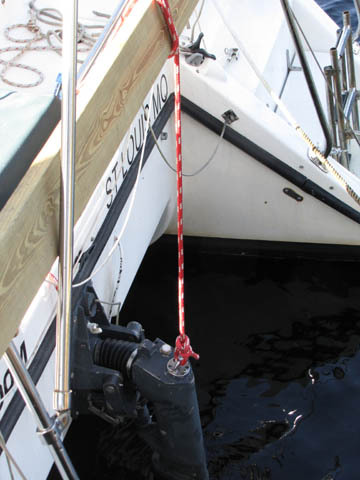 When we anchored, I re-adjusted the the nuts for the outdrive release. This is important for Gemini owners. Do you see the gap between the nuts and the release? This MUST be maintained or you will have your drive kick up in reverse. I personally believe this is the main reason Gemini's have problems with their outdrive's kicking up in reverse. I have only had mine kick up twice in 5,000 hours. The first time is when I figured out the nut to release gap problem. The second was when I had a cable seize up creating the same problem. 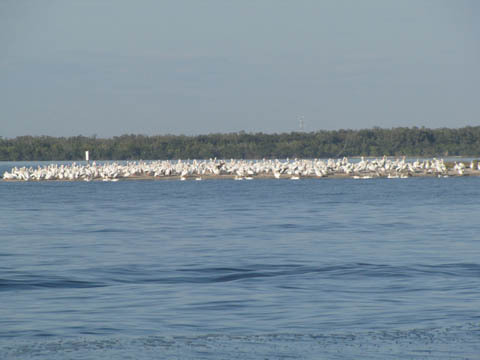 Oh and another tip - If birds are walking, you probably don't want to go boating in that area. As we headed further down the Intra coastal we encountered the car transport. This is in all the guides to watch out because when they go, they have the right-of-way. Besides, they weigh a whole bunch more than we do so it's easy to figure out we would loose in a competition. 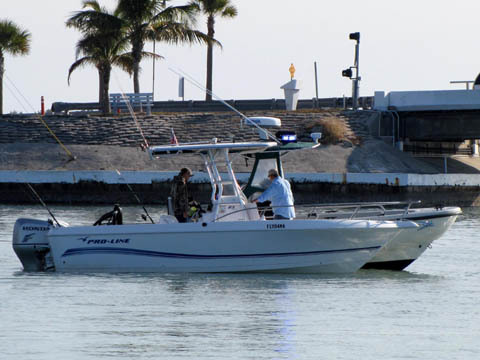 The picture below shows a boater being checked by a Florida officer. 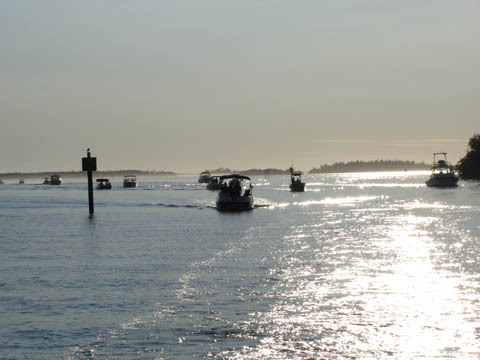 Blue lights flashing and safe boaters. 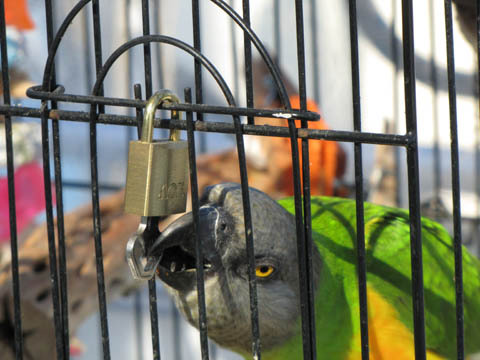 Then to the lower right you can see that Jimmy Buffett is finally figuring out that the key is the KEY to getting out of his cage. I think Deb is going to have to start removing that key from the lock. Pretty soon, J. B. will be turning it and taking off the lock. Who say's that that little head holds a small brain? 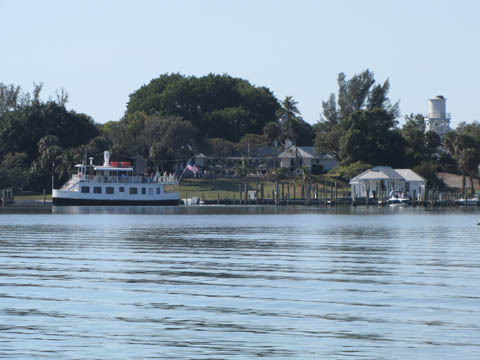 We anchored for the evening so we could stop at Cabbage Key for lunch. Bob hadn't been to this island and it is a must stop. We headed in and picked up a complementary dock so we could walk up the hill and get a cheeseburger in paradise. 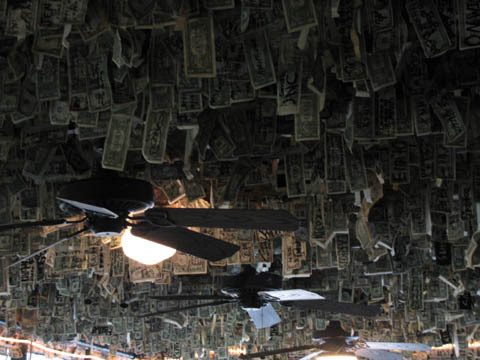 Money is hanging from the ceilings and the walls in the back room. If you haven't been there, don't let the seat you in the front - request the rear room so you can get an idea of the fun. Does it fall off - yes - about $10,000 a year which goes to charities. How much - about $70,000 is hanging. It's an island right - yes, the workers live here too. Power - it comes from an underground cable. Water - That is the water tower that is collected from rain water. 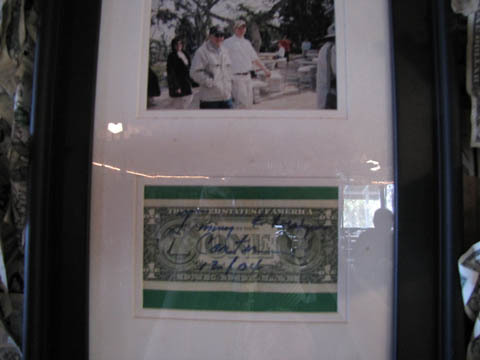 Even Jimmy Carter stopped by as you can see below. Of course the other Jimmy Buffett stopped by too. 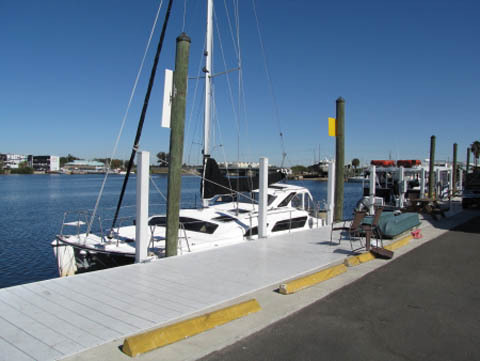 Below you can see a couple pictures of Bob's boat at the end of the pier. To the left you can see why you really do want to keep a watch. The original Aid to Navigation was destroyed and they put in a temporary one. Can you imagine the damage this would do before they put in the temporary aid? 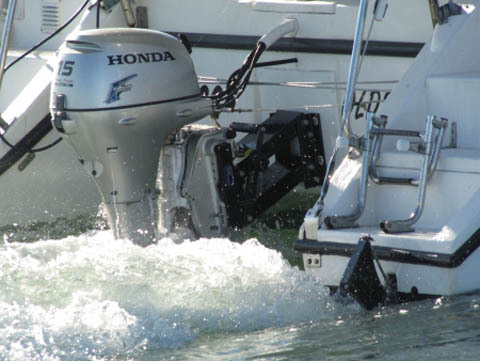 It could really put a hole in your boat - day. Since it was a weekend, there were a few other boats out here with us. Some of them were, wait - most of them were faster than us. Then there were the dolphins. 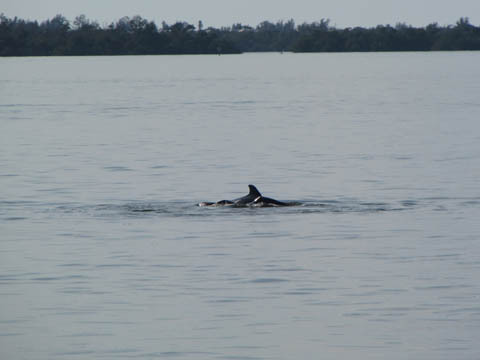 Don't you just love dolphins? Then they say bye with a tail flip. 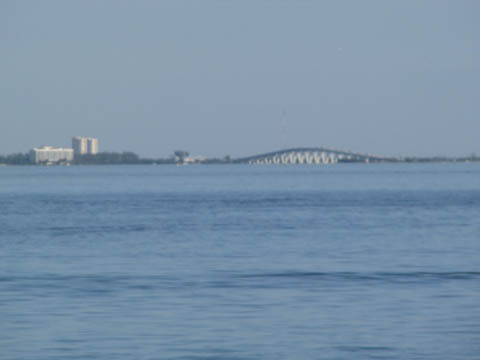 You can see the bridge from Ft Myers to Sanibel below. 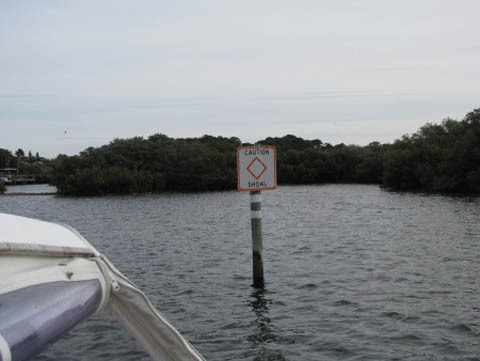 Of course we found another place where you shouldn't be boating too. Not to mention a bunch of birds. This is a great picture - perfect navigation going up the range heading for the miserable mile. Then I just had to run to the other side of the boat just to get a picture for my class showing what it looked like if you were off just a bit on a range. 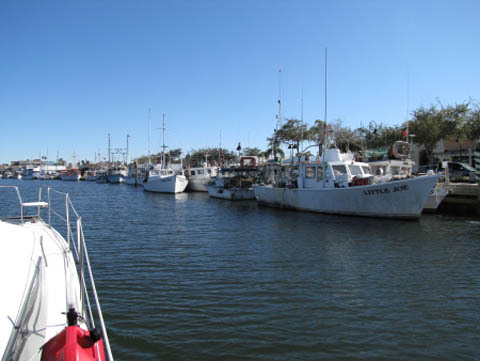 Then I just had to take a picture of all the boats heading in from the Gulf that just happened to be behind us. 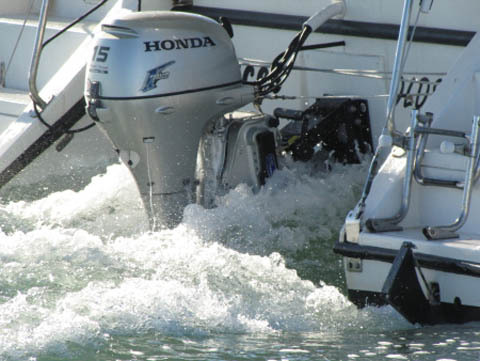 Bob, we may be getting waked just as soon as we get out of this no-wake zone! 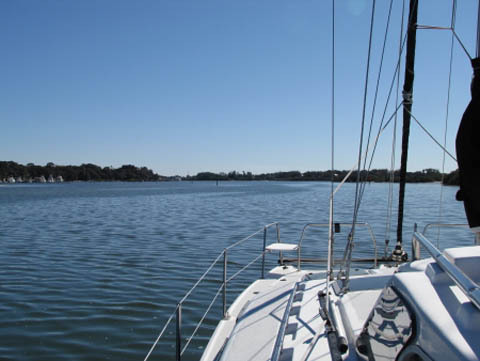 Since we would not make the dock tonight we headed into a new anchorage. 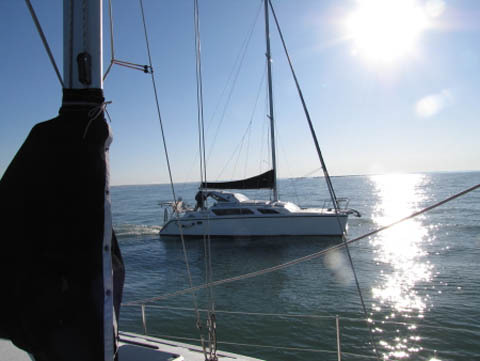 Imagine that - this is a trip of discovery for Bob so a new anchorage is expected. 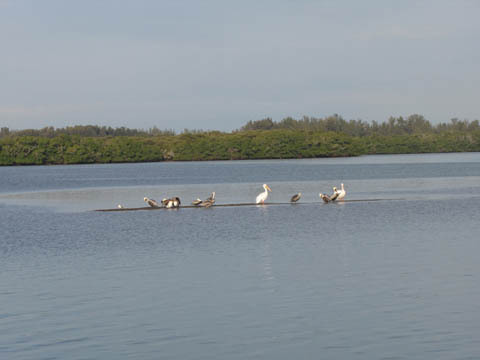 We went to Bimini Basin and had a great evening. The holding is great and with a moon like the one to the right, who can argue with a night on the water. My lovely wife awoke early and was starting to pack when I caught this picture. We were getting close to Ft Myers where we were going to pump out and fill up the diesel. I like to keep the fuel tanks full and the waste empty so you are ready for the next trip. It is always too far between trips anymore since we have a house. 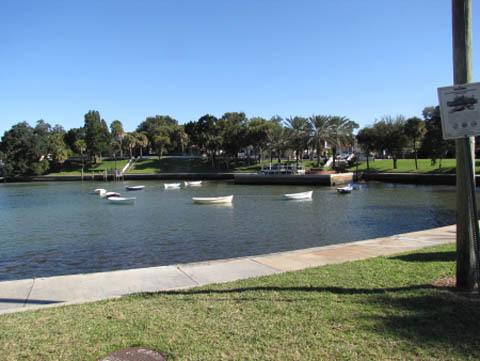 Ft Myers is a really cool town and we are finding that it offers lots of entertainment. We are just starting to explore the area however and are looking forward to more time in the "city" as we live here longer. 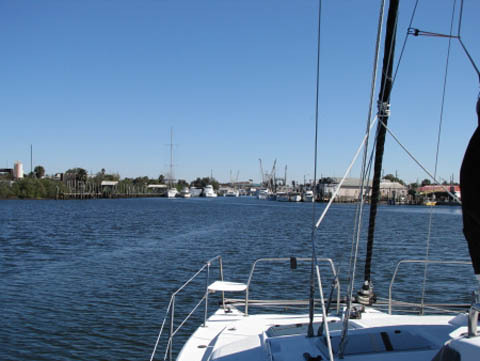 I think we will do that by anchoring out and dingying in to the dock just to ensure we can have some fun too. 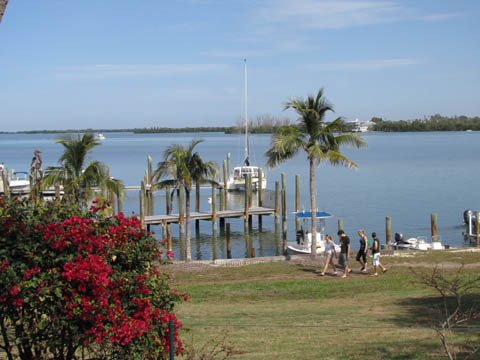 After you leave Ft Myers, it is only an hour and 15 minutes to our canal. The river narrows and just around the bend you see off the bow is a bridge that must open. After the bridge you count 4 canals and turn right. We are home. 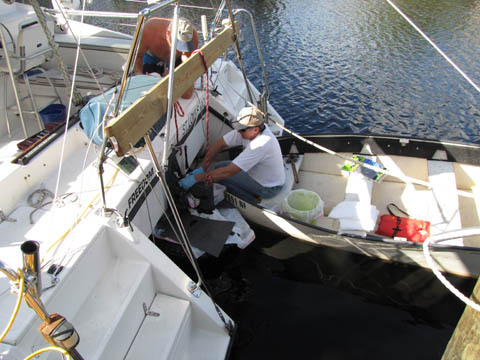 Bob did a great job turning the boat around in the canal and pulling up to his dock. We then took a bunch of stuff off the boat but little food. We did a good job planning the food on this trip and had few overages. Of course there is a list of items that need looking after because, afterall, it is a boat. You have to remember the definition of B.O.A.T. - Bring on another Thousand. In this case, the maintenance will be much less. Remember those outdrive's? Yes, we did remember how to assemble them again. With a table, a work platform, a couple of 2x4's, and duct tape we had a great way to assemble the lower unit. Check out the picture to the lower left. 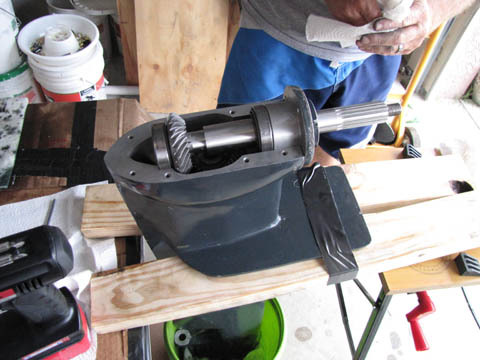 We did a very precise measurement and placed the right number of shims in to set the gear lash at minimum. 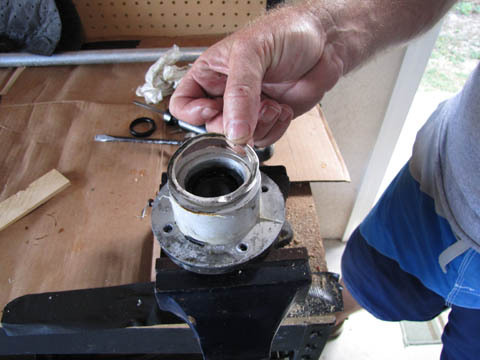 Then using the right bearing fit along with sealant, we assembled the lower unit. The one you see is Gale's lower unit to the lower left. Mine had a few more issues and I elected to use my original shaft in the newer outdrive since my old one with 5,000 hours had less wear than the newer one with less than 2,000 hours. I think synthetic oil had something to do wit that. My shims were different than Gales but it all went together well and as you can see below, I sanded the corrosion (I wanted to say something else) out of it. 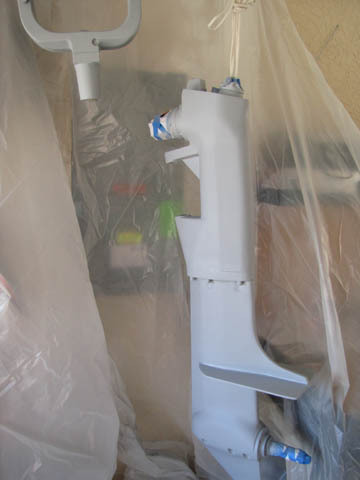 Primer is a critical element in the drive's future. I also found some great foam to protect the grease zert threads and the pin bushings. 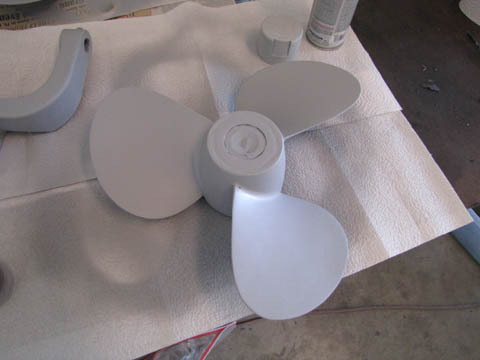 Then it became gray, Primer. I put a couple coats of primer on after washing the entire drive with acetone. Clean off all that wax and grease. Everything has to dry so I can lightly sand it. I can't hardly wait to show you the next pictures which I haven't taken yet. I just had to "pimp my ride." Yes, I decided to paint the outdrive with a Metallic paint. It is really cool black with sparkles in it. I'm sure it will be the outdrive of the future and probably be getting an extra 100th of a knot of speed because of the cool look. Ok, I'll let you decide but trust me, there are only 2 of the outdrive's with this cool of a paint job out there. Let me stop with the fun and say that in reality the sanding, priming, cleaning, and then painting took quite a bit more time than I expected. Bottom line is if you want a good job it takes time. 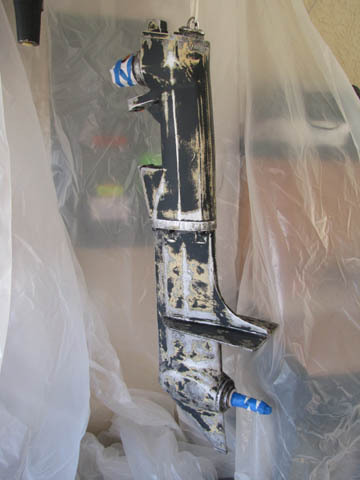 Sanded the prop a bunch and wait until you see it complete. Looks like a new one - and of course it is a bit pimped out too. The numbers stamped on the prop are 15 X 11 L which of course means it is a left hand prop which is why the Gemini backs so well to the right. More pictures in a few days. We mount Gale's drive at Ft Myers Beach tomorrow then mine on Thursday. He has his transom plate painted and mine is in process. See you soon.